PHOTO BY JILL GOSCHE Columbian's Kaeden Hatlay gets a hold of Elida's Evan Unruh during the game at Frost-Kalnow Stadium Friday. Kaeden Hatlay left the celebratory team huddle Friday night. Spotting me on the sideline, the senior Columbian linebacker came up, grinned and shook my hand. “Thanks for picking us to lose,” he said. Spoiler alert: I took Anthony Wayne over TC in Game 2. But now I’m second-guessing. So it goes when your high school football selections are in the newspaper every week. Yes, I selected Elida to beat Columbian in the season opener. Hatlay and (I’m assuming) some of his teammates took delight in proving the prediction wrong. Coach Judd Lutz even mentioned it in the game preview, how many people locally weren’t expecting the Tornadoes to win, and the team was using it as motivation. Good for TC. 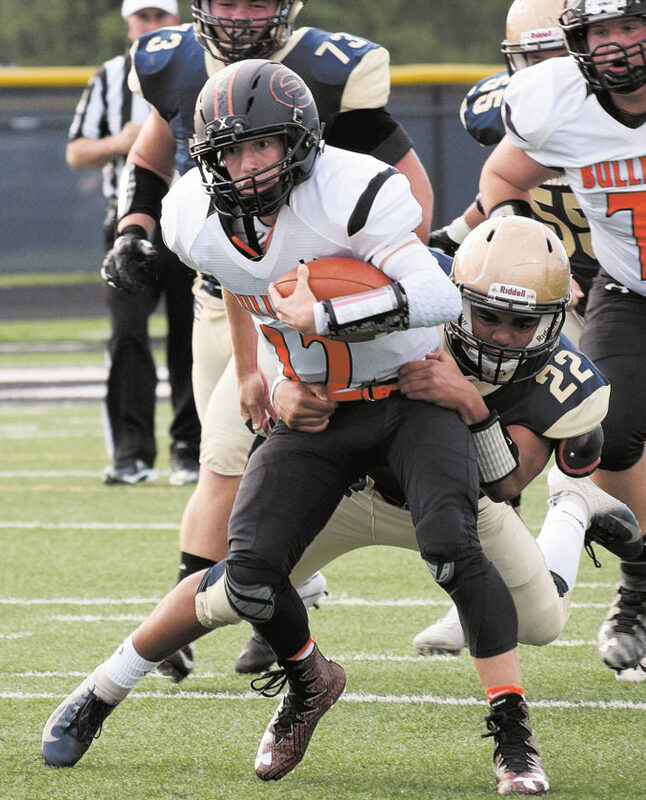 It played great against Elida in picking up its first win since the 2016 season finale. And don’t worry about me. For whatever talents I may possess, predicting the future is not one of them. After all, I took Bowling Green to beat Ohio State in 2016, said Jason Kipnis and Bradley Zimmer would have great seasons for the Indians in 2018, and believed that Peter Cetera would continue churning out chart-topping hits well into the 2000s. Columbian dominating Elida — a 2017 playoff team –35-3 Friday surprised me. Lutz seemed confident in the preseason interviews. Maybe it was the play of new starting quarterback Chase Frankhauser. Maybe it was receiver Nick Koerper or running back Cody Craig. Maybe it was an aggressive defense that piled five tackles for a loss in Week 1. Or maybe he just knew things were bound to change. But as much as Friday’s final result caught me off guard, the postgame reaction from the Tornadoes was equally peculiar. I expected the team, after going 0-10 last year, to go crazy after winning. I half-expected Lutz to be doused with Gatorade. It happened when then-Heidelberg coach Mike Hallett broke a long losing streak by winning his first game in 2007. It happened when Tiffin coach Gary Goff secured his first win after an 0-11 season. That’s not a knock on either situation, since both turned their programs into consistent winners. But by comparison, Lutz’s reaction — and his players’ reaction — to snapping a losing streak was subdued. Now, granted, Lutz won two games with Columbian his first season. He also has been a consistent winner — as a player at TC and Mount Union, and as an assistant at Avon. One win is just that. But I expected there to be more outward joy. The players were happy. Lutz was happy. But when I asked him to put the victory’s meaning into words, the Columbian coach allowed not even a hint of over-jubilation. And that was the takeaway. It was a nice win, but it won’t define the season. Lutz expects to win, and isn’t surprised to do so, no matter how hard last season was. Last season is over. This season is here. Columbian made a statement Friday. And it has more to make. Which may come at the expense of some football picks. Zach Baker is the sports writer at The Advertiser-Tribune.